This is a post I did for Ellen Oh’s blog. Her story, THE DRAGON KING CHRONICLES, is being published by HarperCollins in 2013. We’ve been together on the blueboards for a while, and got our contracts around the same time, so I’m excited to read it! 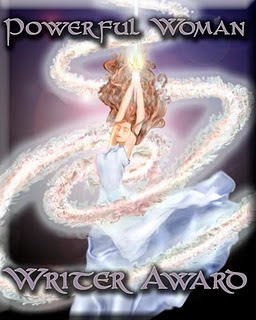 And big thanks to Deirdra Eden Coppel for a ‘Powerful Woman Writer Award’. Apparently she does all the art herself if you’d like to see her blog. Yay! I either have a blog coming up where I talk about what makes a good villain (I’ve seen a bunch of these lately and figured I’d join the discussion), or a blog where I wax poetic about the Book That Changed My Life… Haven’t decided yet which one to write first! This entry was posted in Writing and tagged writer advice, younger self. Bookmark the permalink.